Indian Institute of Management (IIM) Ranchi has wrapped up placements for PGDM and PGDHRM, academic batch 2014-16. About 61 companies made 132 offers to 119 Post Graduate Diploma in Management (PGDM) students, while 24 companies gave offers to 38 Post Graduate Diploma in Human Resource Management (PGDHRM). A total of 35 new companies (22 in PGDM and 13 in PGDHRM) visited the institute for placements this year. 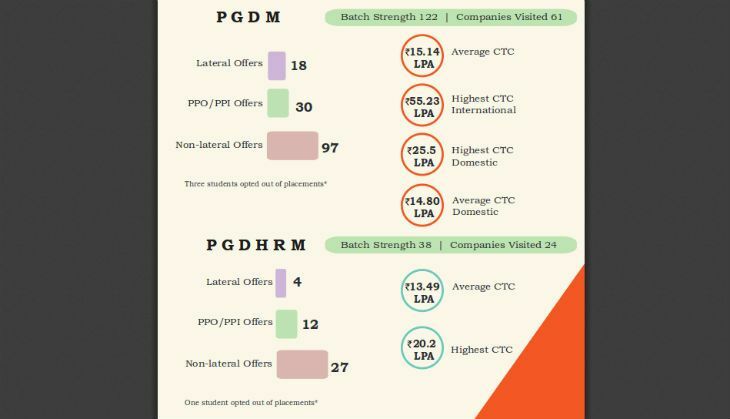 According to a report released by IIM Ranchi, the average CTC offered is Rs 15.14 lakh per annum (LPA) for PGDM, while that for PGDHRM is Rs 13.49 LPA. For PGDM, Sales and Marketing emerged as the most preferred functional area, followed by Consulting, Finance, IT & Analytics, Operations and General Management. The average salary stood at Rs 15.14 lakh. The highest international salary was Rs 55.23 lakh while the highest domestic salary stood at Rs 25.5 lakh. In PGDHRM, the average salary stood at Rs 13.49 lakh. The highest salary offered has also gone upto Rs 20.2 lakh in placement 2016 from Rs 17 lakh in 2015. The institute also witnessed a rise in pre-placement offers (PPOs) and pre-placement interviews (PPIs). Thirty PPOs were made to the PGDM students, while 12 PPOs were offered to PGDHRM students.